King Solomon once wisely said, “There’s nothing new under the sun.” Slavery has existed for a looooooong time. Sure, today, we use the term “human trafficking,” and over the years the form of enslavement has varied slightly, but not much else has changed across all these many centuries. There have been laws passed to abolish slavery, but they only succeeded in pushing it to the dark underbelly of our modern societies. Obscured from prying eyes, slavery rallied and is now reemerging. But, just as there is nothing new about slavery, so also, there is nothing new about rescue – about freedom – about God’s plan of redemption. And no power of darkness can defeat the God who redeems – the God who is always ahead of His enemies who devote themselves to theft, murder, and destruction. The best kind of Life – in generous, heaping helpings – is available to all through the man Jesus Christ. This is the redemption plan that never changes! St. Patrick was a victim of human trafficking as a child. (I admit, that was a side of the patron saint of Ireland that I didn’t know about until I went to college. There’s my shout-out to tertiary education… reminding me to pay my college loan today 😦 ). Patrick was born in Scotland and raised in Great Britain, where he was kidnapped by a raiding Irish army and taken as a labor-slave when he was sixteen years old. He lived as a pig herdsman under the eye of Irish taskmasters for six years. In his angst and isolation as a slave in Ireland, the teenager learned to talk to God and hear His voice. When Patrick was 24, he had a dream where God told him, “Behold, your ship is ready!” Patrick woke up and immediately walked out of the pig fields. He kept walking for 200 miles to the coast, where a boat was docked, ready to sail. The captain needed someone to care for his dogs on board the ship, so Patrick offered his services, boarded, and sailed to his freedom. A divinely orchestrated escape! Now free to choose his path in life, Patrick studied and became a priest. One night, God gave him a dream where the Irish people called out to Patrick to return and walk among them again. So, Patrick did what only God could cause a heart to do – he returned to voluntarily give his life for the nation of his captivity. 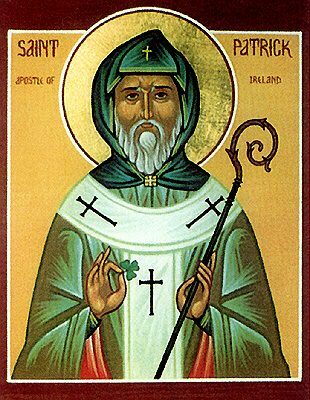 Patrick spent his adult life sharing the good news of Jesus with the Irish, and we remember him today because of the great influence his life had upon the Celtic people. My heart thrills at this hope. A slave was rescued, healed, and his life was not defined by his suffering or abuse. He was mighty and powerful in the Kingdom of God! No, this hasn’t been the story of every slave throughout history, but it has been the story of some, and it will be the story of many more because there is nothing new about God’s plan of redemption. I remember St. Patrick with hope for men, women, and children enslaved today. I pray now for God to encounter hearts in captivity; for Him to orchestrate a way of escape; for Him to heal and restore all that was lost; and for God to fulfill His great plans for our world through the ones that were believed to have been broken beyond repair. I call that divine retribution. God’s justice is breathtakingly beautiful. Posted by Jennie Joy on March 17, 2011 in Awakening, Faith, Freedom, God's Kingdom, Healing, Hope, Justice.